Twenty-two years ago in March 1997 (barely two months after the whipple.org domain was "purchased," and before the Whipple Website existed), I received an email from Oscar Eduardo Whipple Ascui of Chile, telling of his ancestor John William Whipple, who emigrated from the U.S. to Chile in "about 1850." I added John to my PAF database that I eventually used to create what is now the Whipple Genweb. A few years later he was among the initial Whipples to end up on the newly created Disconnected Whipples page. He has remained in the database unchanged since March 1997—until today. Last week we visited the Grand Canyon (south rim) and nearby Sedona, Arizona, primarily to hike. Noting that Prescott is fairly close to Sedona, two of us drove to Prescott in search of Fort Whipple, named for Amiel Weeks Whipple. An email I received last week informed me that Ryan Tedder--lead singer of the band OneRepublic--is my cousin, a descendant of Captain John Whipple of Providence, RI. A visit to Ryan's page in Wikipedia confirmed that relationship. Bennett Whipple recently submitted these two photos of the former home of Dr. Robert Lafayette Whipple. The home is now the property of the First Baptist Church of Cochran. The church named it "The Whipple House" in his honor. Possible Leads on the Ancestry of Captain John Whipple of Rhode Island? Ancestry.com's Motion Picture Studios Directory has two entries about the career of Clara Brimmer Whipple, born in Missouri, who attended school in a convent in Germany and finished her education in Switzerland. More Background on Captain John? "Has there been any progress in finding any more background on Captain John?" In my project to make the pages of the the whipple.org sites more friendly to mobile devices (such as iPhones and Android phones), I revisited a page first posted in 1998--nearly 15 years ago! During an August 2005 visit our daughter at RAF Lakenheath in the U.K., we found time for a day trip to Bocking, Essex. Addison Beecher Colvin "Cal" Whipple, war correspondent who became a Washington reporter for Life magazine in 1943, died on St. Patrick's Day. Cal was responsible for publishing a controversial "Picture of the Week" in Life in 1943, next to an editorial about the reality of World War II. "War Bond sales skyrocketed; and the [government's] censorship rule was abolished." It's been over a month since Blaine Whipple informed me that Nova Scotia has put their birth, marriage and death (BMD) records online. Many Whipples migrated to the Maritime Provinces during America's colonial period. If your relatives lived in Nova Scotia, check out Nova Scotia Historical Vital Statistics (https://novascotiagenealogy.com/). Bishop Henry Benjamin Whipple's collections are the subject of a new web site, In honor of the People: Exploring American Indian culture in the Bishop Whipple collections. Gertrude May (Kimball) Whipple, the Whipple Flag's "Betsy Ross"
Yesterday Dave Martucci of the North American Vexillological Association sent this newspaper clipping of Mrs. Wayne Whipple, who apparently sewed Wayne Whipple's flag of 1912. Dave gave permission to post the clipping. Blaine Whipple recently submitted a link to a biography of John Adams Whipple (1822-1891), the first manufacturer of chemicals required for daguerreotype--the first commercially successful photographic process. His photographic studio became the most successful in Boston. Frank Whipple, East [London] End legend, passed away on Wednesday, August 24, 2011, at the age of 103. He died at the Royal London hospital. He was known in East London as a "campaigner, football fanatic and devoted family man." He was admired as the the U.K.'s oldest carer [caregiver] because of his dedication in taking care of his daughter Peggy, "born with severe special needs." Read the entire article in the East London Advertiser. Seven or more years ago, Joanne Lahr-Kreischer introduced me to J. Reed Whipple (full name: Joseph Reed Whipple) when she submitted "J. Reed Whipple and Boston Hotels" to the Whipple Website. Born in New Boston, New Hampshire, Reed remained connected with his roots, even after becoming a noted Boston hotelier. Blaine Whipple recently noted a set of web pages that include one page devoted to Bishop Henry Benjamin Whipple--first bishop of the Protestant Episcopal Church in Minnesota. The Bishop's page is part of the Famous Trials web site by Douglas O. Linder (2011), University of Missouri-Kansas City (UMKC) School of Law. Today Lucian Adolphus Whipple Sr. would have been 132 years old, as I was reminded when I received a note this morning from his descendant, Bennett Whipple. Lucian lived to be nearly 101 years of age. He is in the Whipple Genweb at http://whipple.org/21479, where you can see a photo at age 100. This photo is of Lucian in his younger days. Labels: Georgia Whipples, Lucian Adolphus Whipple Sr. Earlier this year the University of Florida Press published a brand new biography of Commodore Abraham Whipple, by author Sheldon S. Cohen. The Whipples of Ipswich and Its Hamlet / as written and compiled by Raymond A. Whipple Jr. -- 2d ed. -- Beverly, MA : Minuteman Press, c2009. -- 72 p. : ill. (some col.), coats of arms, facsimiles, genealogical tables, maps ; 28 cm. -- ISBN 978-1-60402-000-7. I see there is still some doubt among Whipple researchers about exactly which John Whipple it was that sailed from England to New England in 1632. Since I am probably at least responsible for the continuing confusion, I should also help set the record straight. Blaine Whipple reports a blogger who has chronicled his experiences at Whipple Cave in the Egan Mountains of Nevada. I haven't had time to research the cave, but I can't help but wonder if the cave's name might have something to do with Amiel Weeks Whipple, the military engineer and explorer who (among other things) led an 1853 expedition in search for a railroad route near the 35th parallel of latitude to the Pacific Ocean. Jeff Congdon sent this photo "from his iPhone." This Whipple Street is in the Newport (RI) Naval Base. Jeff's brother, Steven Whipple Congdon (a retired Coast Guard Commander), provided access to the otherwise restricted naval base. I received an email yesterday, telling me about Whipple cousin Noah Bean, who appears on the TV series Damages. (Hmmm... When was the last time I watched TV? I still have a television, don't I? Does it still work?) Our cousin who sent this information says that Noah is the son of Ruth Harriet Whipple (http://whipple.org/121022). Jeff Congdon submitted this photo today. It is the front of Whippletree Farm Antiques, located at 210 Main Street, Wauconda, Illinois. Jeff took the photo himself. I've received several reports this week about a new "one-stop shop for Michigan historical records," called Seeking Michigan (http://www.seekingmichigan.org). Seeking Michigan is a partnership between the Library of Michigan and the Archives of Michigan. It includes digitized state records. 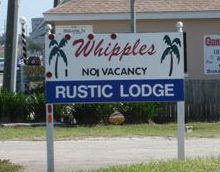 Jeffrey Congdon sent this photo of the "No Vacancy" sign at (apparently) Whipples Rustic Lodge in Florida. Robin Gilebarto submitted this photograph of pupils at the school on Lambtown Rd. in Ledyard, Connecticut, complete with names of just about everyone in the photo. (Submitted 1/27/2009.) Can you substitute a name for the question mark below? Miss Arliss Sutherland was the teacher. 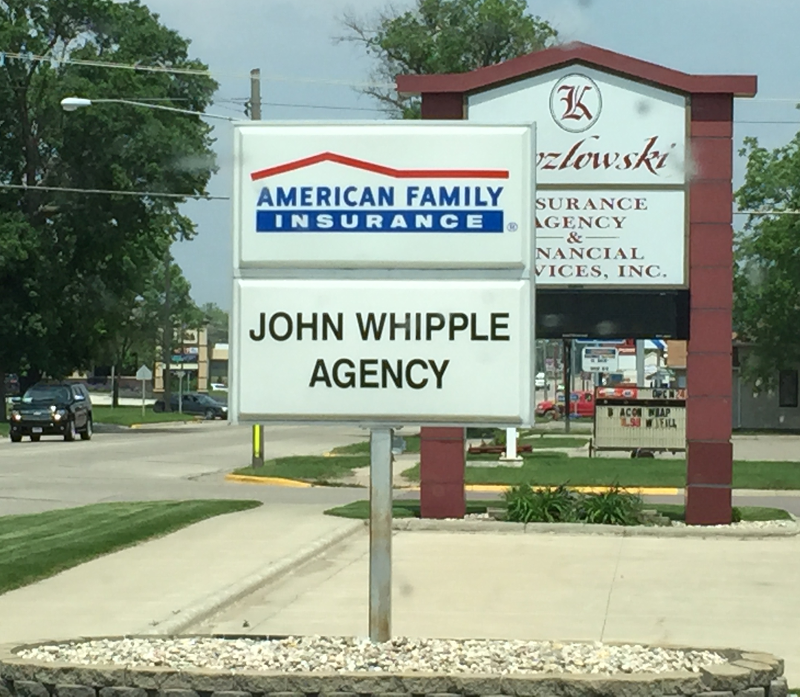 I watched it yesterday on TV and have received numerous phone calls and emails reporting the event, so we probably ought to mention it on the Whipple Website's blog. U.S. Women's eight rowing team received a gold medal yesterday at the Beijing 2008 Olympics. The team's coxswain was Mary Whipple of Orangevale, California. The finish of a family tree. In foreign land and distant climes. This is the house of William Whipple, one of the signers of the Declaration of Independence. (Read his Wikipedia entry.) Today his house, located in Portsmouth, New Hampshire, is a National Historical Landmark open to the public. We salute William and the other founding fathers for their role in the birth of the United States! Today Blaine Whipple (see blainewhipple.com) emailed about a web site devoted to Clara Barton's birthplace. You will recall that Clara Barton founded the Red Cross; did you know that she is also a Whipple?